Original photo and information by Peter Atkinson and many thanks to the Club for welcoming us in to take further photos. The list of names on the Roll of Honour in the photo above and the list that appeared in the Barnsley Chronicle on 26 March 1921 differ slightly. 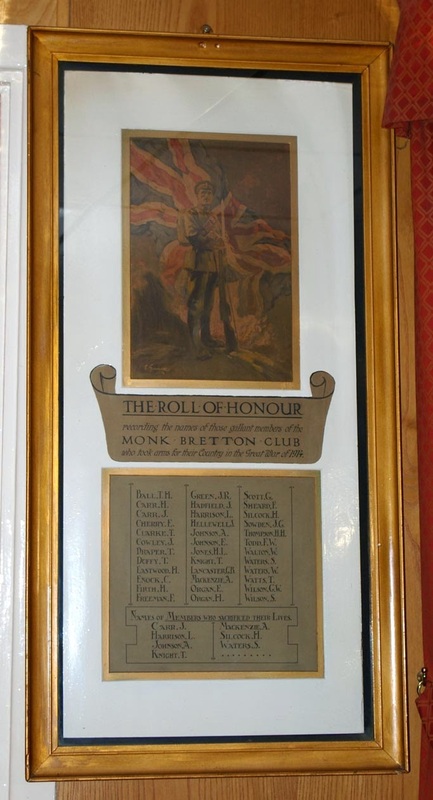 On Sunday evening (21st March 1921) an impressive ceremony was performed at the Monk Bretton Working Men's Club, when Capt G B Lancaster unveiled a Roll of Honour to members of the club who served with HM Forces during the great war. [...] The Roll of Honour, which is not yet complete, bears 42 names and more are to be added. I was very interested and proud of the comments made by my Great Grandfather, Joseph William Johnson, President of the South Yorkshire Branch of the Club Union at that time. He was a credit to the Johnson family and to Monk Bretton.